Looking for Epic clash between India vs Pakistan Live Score Updates and Live Streaming Online?Read more to know best places to get Live score updates, and you can learn How to Watch ICC T20 World Cup 2016 Live Streaming Online.Because of the security concern, the India-Pakistan match was shifted over from Dharamsala to Kolkata. The match will be started on 19:30 IST at Eden Garden, Kolkata. 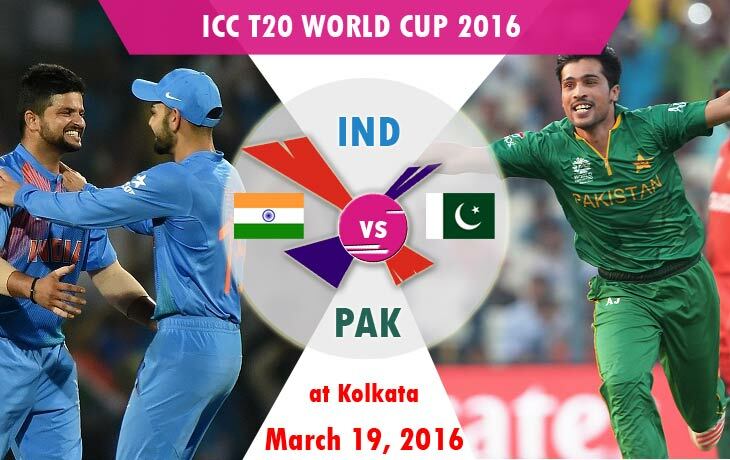 The Asia Cup 2016 Title winner and the T20 world Cup host nation, India going to face the neighbour country, Pakistan. Previously, both of the team played each game on Super 10 of this tournament. Where, India lost by 47 runs against with NewZealand and Pakistan won by 55 runs against with Bangladesh. The team India slightly moved their foot back on the opening game of Super 10 but, this team have all the ability to play T20. That’s why the India stands at the First rank on the ICC T20 ranking board. The Opening batsman of Pakistan, Sharjeel Khan, Ahmed Shehzad, and Mohammad Hafeez. And the Opening batsman of India, Shikhar Dhawan, Rohit Sharma, and Virat Kohli. By reviewing those top order, where both of the team is soo strong. Here, we didn’t predict anything about their scores. If any changes made in India mean, there is a chance for Mohammed Shami in the place of Ashish Nehra. But, the Captain Dhoni’s 11 may remain same as an Eleven men in Blue. On Pakistan, the most wanted key player is well known, Mohammad Amir. Sharjeel Khan, Ahmed Shehzad, Mohammad Hafeez, Umar Akmal, Shoaib Malik, Sarfraz Ahmed (wk), Shahid Afridi (cap), Imad Wasim, Wahab Riaz, Mohammad Amir, Mohammad Irfan, Anwar Ali, Khalid Latif, Mohammad Nawaz, Mohammad Sami.